Now that May has arrived, it's about that time when we start scrambling to make up for a season's worth of hibernating. Unless you worked out all winter, and in that case, I admire you. While I'm not by any means a fitness guru, I do understand the immediate health effects of working out on my aging body and the opportunity I still have to improve. Cue yoga, my favorite way to get back in shape after an exercise slump. 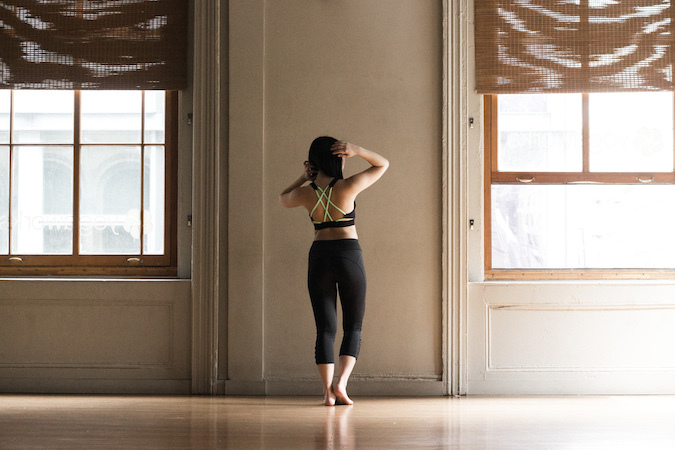 I spent the majority of April getting back on my feet with the help of YogaWorks, a studio with locations both throughout New York City and nationwide. There is a countless number of workout class offerings just in this city (and I've tried quite a few), but what stands out about YogaWorks is its openness to all people and levels. After a long season of slacking off on exercise, I still felt confident about myself in these classes. That, to me, is the most important thing when it comes to body health -- feeling good from the inside out. What better method than yoga to strengthen your mind and body at the same time? So I've geared up in my Boohoo FIT workout wear and finally taken steps to re-include regular exercise into my weekly routine. It always feels easier when you're surrounded by other motivated people in class and instructors who can guide you along the way. It's all about baby steps. The work out wear is simple and yet beautiful, it's nice sometimes to detox your mind meditating and doing yoga. Love these photos and the workout outfit, so cute! The workout outfit looks great and comfortable. I had never considered BooHoo for fitness attire till now, you look fantastic in your sporty wear. Love the pictures, your workout clothes look gorgeous. I really want to give yoga a go. Your workout gear is amazing. I would love to do yoga too. I'm loving the yoga outfit, and that studio space looks amazing! I wish I could get up and get started already. Kudos to you. There are such a large number of the site which is offering the medications which are used for weight training, however, I can't certain that these medications are unique frame and won't cause any reaction on a human body. So to purchase the weight training drugs I generally prescribe you to pick this http://worldfitnesscr.com/ which is a firmed for offering this kind of medications.